I'm Here. I'm Queer. What the Hell do I read? : Lost Gay Fiction - Queer Short Stories Online by E.M. Forster, Willa Cather, Ernest Hemingway and more! 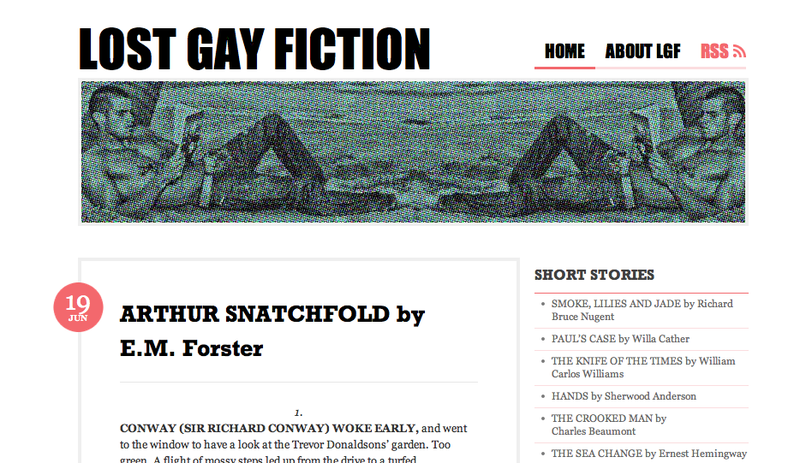 Lost Gay Fiction - Queer Short Stories Online by E.M. Forster, Willa Cather, Ernest Hemingway and more! I didn't know these short stories as posted at Lost Gay Fiction, but I'm having a great time reading them. There's nothing explicit in the two I read (Arthur Snatchfold by E.M. Forster and The Sea Change by Ernest Hemingway) but I would say they're Young Adult. With ten short stories posted so far, it's a great site to know about. I think just about everyone read Paul's Case in high school, but the rest of these would be amazing to come across.